The EtG urine test checks for the presence of two metabolites that are present after drinking alcohol. This urine EtG test checks for ethyl glucuronide (EtG) and ethyl sulfate (EtS). An EtG test measures the ethyl glucuronide (EtG) and ethyl sulfate (EtS) urine levels. Why is an EtG test important? The EtG test is used to help assess for longer term alcohol ingestion. An EtG test is sometimes used in testing programs to evaluate whether alcohol was ingested recently. This EtG Test is a urine test. The EtG test, sometimes known as an EtG urine test, alcohol metabolites test, and EtS test, checks for EtG and EtS alcohol metabolites in the urine. Although not a standard part of 7 panel or 10 panel drug tests, the EtG test does play an important role in screening for alcohol consumption by checking for the presence of metabolites that are produced by the body after drinking. Components of this test include ethyl glucuronide and ethyl sulfate. Ethyl glucuronide is a metabolite of ethanol that is formed by a process in the body known as glucoronidation after drinking alcohol or ethanol. Ethyl sulfate, also known as sulfovinic acid is another component measured in this urine test and has been utilized as a screening biomarker for alcohol consumption. If you are wondering how long alcohol can be detected in the urine, research indicates that EtG may be detectable for up to eighty hours (hence the name 80-hour EtG test) and EtS may be detectable for twenty four hours after alcohol consumption. EtS is typically found at lower concentrations than EtG in the urine and the EtG / EtS ratio is sometimes used to confirm the accuracy of EtG urine test results. This EtG urine test is frequently used as a screening marker to check if someone is drinking alcohol (ethanol) when they are not supposed to be doing so. Examples of situations during which people might be required to get their EtG levels tested include being part of an alcohol abstinence program, school, the military and for professional reasons. The EtG test is a very sensitive test and, at very low levels, can possibly lead to a false positive result due to exposure from sources unrelated to alcohol. Infrequently, an EtG urine test might be positive from food, inhaling alcohol used on the skin, and mouthwashes containing alcohol. Unfortunately, when positive, this ETG test cannot identify the actual source of the alcohol. To get an EtG test near you, simply order online and get your urine tested at the Quest Diagnostics lab that you selected. 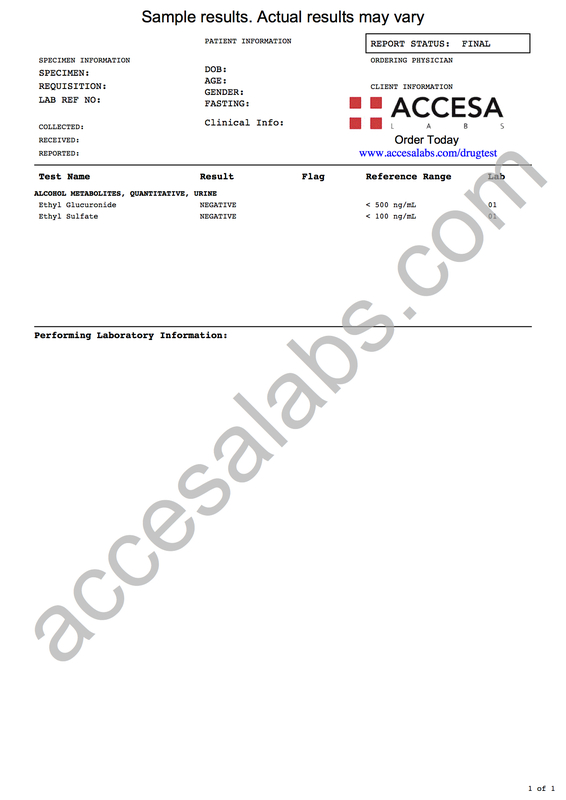 Once your EtG lab results are ready, they will be available for download. As can be seen on the sample EtG lab report above, the ethyl glucuronide and ethyl sulfate levels will be reported as negative if no alcohol metabolites are detected when compared against the reference ranges provided by the lab. How long does it take to get EtG test results back? In general, it takes four business days or less. People who are getting their EtG urine test in a major metropolitan area will sometimes have their EtG lab results back faster than that, depending on the lab. Historically, some people were able to perform EtG testing at home using hair kits. However, more recent guidelines suggest that hair EtG testing is not generally recommended but may be considered in cases of excessive alcohol consumption. This particular EtG urine test is not considered a chain of custody test. EtG Test at Guaranteed Prices.